My essay of 1994 (!) Aesthetics of a Virtual World has been featured in the current Antennae's Virtual Animal issue. 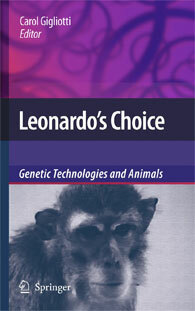 Leonardo’s Choice: Genetic Technologies and Animals is an edited collection focusing on the profound affect the use of animals in biotechnology is having on both humans and other species. These essays, unlike the majority of discussions of biotechnology, take seriously the impact of these technologies on animals themselves. This collection’s central questions address the disassociation Western ideas of creative freedom have from the impacts those ideas and practices have on the non-human world. This transdisciplinary collection includes perspectives from the disciplines of philosophy, cultural theory, art and literary theory, history and theory of science, environmental studies, law, landscape architecture, history, and geography. Its authors are at the forefront of the growing number of theorists and practioners concerned with the impact of new technologies on the more-than-human world. The Struggle for Compassion and Justice with Critical Animal Studies in the Oxford Handbook of Animal Studies is now available online here. The print version is due out later this year. Hard Destiny: Julie Andreyev’s and Simon Lysander Overstall’s “Salmon People” This essay is available to read here. Her edited book, Leonardo's Choice: Genetic technologies and animals, published by the Ethics/Philosophy Area of Springer in hardcover in 2009, is now available in paperback. "Animal Influence" Closing presentation, Interactive Futures'11: Animal Influence. ECUAD, Vancouver, BC. Nov 17-19. Online video available here. Moderator, "Non Linear Story Telling" The International Digital Media Arts Association Conference 2010 Vancouver, BC. Nov 4-6. "Animals and Art" Department of Art, University of California, Santa Barbara. Apr 29, 2010. "Placing the Human: Roundtable with Phiip Beesley, Char Davies, Carol Gigliotti, and Jeff Malpas" Jackman Humanities Institute, University of Toronto. Mar 26, 2010. She is on the Review Board of the online Journal for Critical Animal Studies. She is on a number of international Advisory boards concerned with either media or animal studies and often reviews for university and commercial presses as well as serving as a research reviewer for governmental funding organizations. In the Spring of 2008, she was the Recipient of the John and Betty Gray WritingResidency at The Sitka Center for the Arts and Ecology. Since 2009 she has been on the Senior Academic board of the online journal Antennae: the Journal of Nature in Visual Culture. Her CV in pdf form is available here. The essay "Animal Influence", introduces the ANIMAL INFLUENCE double issue of ANTENNAE: Journal of Nature in the Visual Art documenting and reflecting on the Interactive Futures11: Animal Influence Conference, Exhibitions, Screenings and Performances at ECUAD in November 2011. The first issue, Issue 21, Summer 2012 may be found here. Interview with Marc Bekoff, Keynote Speaker at Interactive Futures11: Animal Influence, Antennae:Journal of Nature in Visual Art, Issue 21, Summer, 2012. (forthcoming). Guest Curator, Interactive Futures11: Animal Influence. Conference, exhibtions, screenings and performances. ECUAD, Vancouver, BC. Nov 17-19. Gigliotti, C. " Heartburn: Indigestion, Contention and Animals in Contemproary Art." Antennnae: Journal of Nature in Visual Culture. 14/Autumn 2010, 25-33. "Animals and Art" Department of Art, University of California, Santa Barbara. April 29, 2010. "Placing the Human: Roundtable with Phiip Beesley, Char Davies, Carol Gigliotti, and Jeff Malpas" Jackman Humanities Institute, University of Toronto. March 26, 2010. Interview by Antennae editor Giovanni Aoli in Issue 9, Spring 2009. Earth First Interview with Carol Gigliotti on KFCF 88.1FM Fresno Affiliate of Pacifica Radio in Berkeley California. Animal Voices Vancouver's Karl Losken interviews Carol GigliottCRFO 102.FM, Vancouver. September 12, 2008. Bioartists' Flesh Sculptures Draw Fans and Critics including critical commentary by Carol Gigliotti on NPR, Dec. 10, 2007. Interview by CBC's "Q" host Jian Gomeshi with Carol Gigliotti concerning the VAG's controversial "Theatre of the World" Exhibit , April 16, 2007. Interview by CBC's "On the Coast" host Priya Ramu with Carol GIgliotti concerning the VAG's controverisal "Theatre of the World" exhibiton, April 11, 2007.